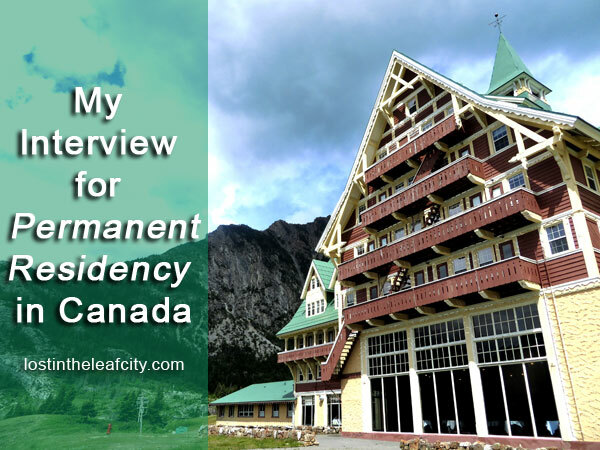 As promised in my previous post “Office of the Citizenship and Immigration Canada (CIC), Calgary” I am writing this post about my experience in undergoing an interview for permanent residency in Canada, made possible through the Live-in Caregiver Program (LCP). Warning: this is a long post yet worth your time. I scoured all my documents/archive. (I still have all my application starting from my LCP application in the Philippines. After I submitted my application for open work permit and permanent residence under the Live-in Caregiver Program, I didn’t have much anything to do other than waiting. It took me three and a half months to receive the open work permit through the mail. As for the permanent residency . . . it feels like forever. I received a letter of confirmation that my permanent residency application in Canada was received then came the long hibernation. Or maybe not. I wouldn’t sit still and wait. I kept checking my application online and it always says “in processed” nothing more. Sadly, you can’t do that online anymore. The CIC website has changed; you can only check for permanent resident card and nothing about the residency. At least it will save you the trouble of constant checking . . . and worrying. I also sent a copy of my new Philippine passport. That’s right! You have to keep tracking if the submitted documents are still valid such as passport. So I did a lot of things besides being anxious (which you should avoid). But what I didn’t do is to call the CIC Call Centre regarding my permanent residency application. I did call regarding my open work permit. I was patient but when it was already more than three months of waiting, I had to call which is my least favorite of doing among the mundane tasks. Then amidst chaos, the hibernation ended sooner compare to other applicants. I received three letters; the last one is a letter of invitation (through mail and email) for the interview for permanent residency in Canada . . . after a year. The third letter is about the schedule for the final determination interview. The wait was longer than winter; nonetheless, it felt like spring when I read the letters. Here comes the new beginning. OK so it wasn’t a long list of requirements after all. I was all set till I remember that I’m still waiting for my passport. The interview location is at the CIC office (Harry Hays building) in Calgary . I chose to send an email to reschedule the interview for the permanent residency. If you like you can call; as for me, I always prefer the email. If the information is incorrect, can you leave a comment. The information came from the letter I received years ago so I cannot vouch for its accuracy. Now back to the email. I received a quick reply from CIC office in Calgary. I had to choose among the suggested dates and I was all set. With all the setbacks dealt with I was so relieved. You don’t have to go through this especially if you’re reading this blog post before the interview or you’ve just submitted the application for permanent residency. Spare yourself from all the trouble. And keep reading. Next stop is the interview. I’am currently working as a domestic worker caring children ages 7 and 9 here in Hong Kong for almost three years and planning to apply in Canada. I’am a graduate of only 2 years course in college which is more than 72units. I know I am qualified to apply as nanny in Canada based on my experiences and the required school credits. But what makes me stop to apply is that the 2 years of college I have gained is not enough to apply for PR as one of the requirements needed. Knowing that 2 years in college in in the Philippines is equivalent only to a secondary graduate in Canada and to gain at least 1 year post secondary is required to get PR. I’m just being worried that I wont be eligible for PR for the whole 4 years. Is it possible to continue study in Canada of at least 1 year while working as nanny? Are there some schools in Canada that offers courses for foreign nannies who wants to continue their studies? If so can you help me guide through this situation by giving me some information so i know what to do. Thanks. Hazel13, these links will help you to take the best route and don’t jump to conclusion: become a permanent resident and studying in Canada. Hi. I submitted my PR application and I think I am in the final stage of the process. Last update I saw on my profile around April of this year was that I passed medical exam. Normally, as I’ve been told, passport request comes after medical exam. I am in a sort of a dilemma now coz I didn’t know before I submitted my application that i can include my girlfriend (we lived in together for more than a year before i left the Philippines) in my application as a common-law partner. And this time i want to include her while my PR application is pending final decision coz some say that i won’t be able to sponsor her once the final decision has been made. Can you please enlighten me on this one and advise me what to do? Hi Han. You should inquire about your application to an immigration consultant as I am not knowledgeable in such topic. What I do know is that you can sponsor her as your spouse if both of you decided to get married. Best of luck and hope you keep us updated. I became permanent resident last June 6 2017. I’m just wondering because until now I did not get the second letter in regards of passport request for my child back home. I’m still waiting for it but until now nothing. Please help! Ji the best thing to do is to call the immigration. You have to be patient if you call and stay on the line. It is better to ask if the letter has been sent or still on the process. When I was waiting for my work permit, I called the immigration and I’ve been told of the waiting/processing period. And true enough, I got my work permit in the succeeding weeks. hi. i just got that landing interview letter. woohoo! i read ur post, saw u mention rescheduling the date, how did it go? i live 4-5hours from vancouver, where the interview will be, it’s winter driving and i haven’t done that for long trips. anyways, im thinking of getting a different date, but worried that they would think im not that eager to have my pr.. share your thoughts?? 🙂 thank you. Congratulations, Abigail! I sent an email to reschedule the interview. Of course, you need to give a valid reason. I immediately received a positive response and I had to choose on the available slot. Good luck. Have a safe journey. Don’t forget to read the tips on the2nd part of the Permanent Residency interview in Canada.